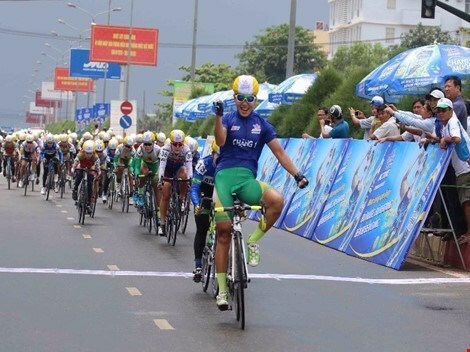 Hanoi (VNA) - Nguyen Thi That maintained her lead in the National Women’s Open Cycling Tournament, An Giang Television Cup, after the second stage on July 11. The cyclist from the Hat Ngoc Troi crew finished the 122km from Gia Nghia of Dak Nong Province to Dong Xoai of Binh Phuoc Province with a time of 3hr 35.41min. She was followed by Pham Hong Loan of Biwase Binh Duong) and Kang Hyungkyung from the Republic of Korea. As the organisers started counting time for individual and team categories from this stage, That was given the yellow jersey to start the next stage. The national team member That also kept the green jersey as she strengthened her position at the top with 42 points after two stages, setting a 19-point distance with the closest runner-up, Kim Hyunji of the Republic of Korea. “My teammates worked very hard to support me to win this hilly stage. I am now keeping two individual titles and will try my best until the end of the race,” said That. In the team events, the Republic of Korea who had three members in the first group on July 11 were on top of the ranking with a total of 10:47.03. Hat Ngoc Troi and Biwase Binh Duong were second and third, respectively.